Below is a selection of replacement batteries for the BT Verve 410 range of cordless house phones. 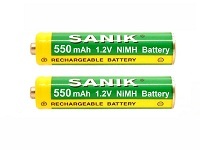 These batteries are 2.4v and 600mAh in capacity ( the voltage runs the phone and the mAh figure determines how long it lasts on a charge ) and they are direct replacements for your BT Verve 410 phones. It is possible to tell when a battery is coming to the end of its useable life when it starts to give you less time on the phone or starts beeping when you are in conversation. This is normal and means that it is time to replace your batteries. You can either choose your battery from the model of your phone - BT Verve 410 or by the code on the battery - 5M702BMX or 5M702BMXZ. The code will have a specification next to it and will say 2.4V Ni-MH 600mAh on it. When you install your new battery, please refer to the manual for charging instructions for a new battery - most types like to charge on their base for 20 hours initially.